The key factor attributed to the growth of the global flexible plastic packaging market is the cost-effectiveness and increased shelf-life of the product. Packaging manufacturers are steadily searching for less expensive substitutes material for packaging to minimize the rising costs and raw materials and price volatility, which subsequently leads to the high production costs, which in turn, reduces the profit margin for them. Flexible plastic packaging is considered as the right choice for safe, durable, contamination free food and beverage packaging. Flexible packaging provides numerous advantages over any other type of packaging. The benefit associated with the flexible packaging to ensure the safety of the packaged product includes- easy detection of spoilage and preventing substances to avoid spoilage, increased barrier protection, recyclability, high standard of health, safety and sustainability. It also helps to reduce the overall supply chain costs, as it requires less materials than traditional rigid packaging. Flexography printing technology uses the flexographic inks to print the flexible plastic packaging materials such as corrugated cardboard, cardboard boxes, plastic bags and paper bags, newspapers, food packaging, catalogues, etc. Flexography printing technology is used for printing on a wide range of flexible plastic packaging materials such as PVC (Polyvinyl Chloride) plastic and on several types of plastic such as stand-up pouches, flat pouches, rollstock, gusseted bags, wicketed bags and wraps. Flexography printing technology has several benefits such as the flexographic ink requires extremely less drying time, allows for printing both the non-porous and porous surfaces. Also, its simple plate-manufacturing process allows for printing huge quantities of images with just one template, and the technology allows for printing continuous image patterns. Stringent environmental regulations are the major factors hindering the Flexible plastic packaging market. Strict legislations are designed to mitigate the adverse effect on health and environment of consumers and workers. The indiscriminate disposal of plastic has become a major threat to the environment. Rising prevalence of stringent regulation has increased the demand for environment-friendly material such as bioplastics. This is expected to hinder the market growth of flexible plastic packaging market. There are a number of eco-labels and government regulation to reduce the impact of harmful products on the environment. The Global Flexible plastic packaging market segments include type, printing technology, and application. The report scope is widely categorized on the basis of its components which includes different types of flexible plastic packaging. Moreover, the market revenue estimates and forecasts includes only flexible plastic packaging and excludes the conventional packaging. Asia Pacific is anticipated to account for the largest market share during the forecast period. The flexible plastic packaging market in the Asia Pacific is primarily driven by the dominant position of Asia Pacific region in plastic production, high investment for setting up flexible packaging production plants and growth in the food and beverage market. Countries in the Asia Pacific region accounted for approximately 50% of the world plastic production in 2015. High plastic production is the result of the high demand for plastics from fast moving consumer goods, food and beverages, pharmaceutical and other sectors. Further, these high investments for setting up production plants for flexible packaging have also provided a major impetus to the growth of flexible plastic packaging market in the Asia Pacific region. The Flexible Plastic Packaging Market is segmented on the basis of types which are sub-divided into stand-up pouches, flat pouches, rollstock, gusseted bags, wicketed bags, wraps. The market is also segmented on the basis of printing technology which is sub-divided into flexography, rotogravure, digital printing, and others; and on the basis of applications which are sub-divided into food & beverages, healthcare, cosmetics & toiletries, and others. These companies are using organic and inorganic strategies for growth. For instance, on 9th November 2016, packaging giant Amcor acquired Chinese company Hebei Qite Packing Co. Based in the Northern China province of Hebei, the Chinese company’s acquisition is thought to generate sales of over $36million in flexible packaging products to a domestic customer base within the dairy and food sector. In May 2016, Bemis Company Inc announced that it had completed the acquisition of the medical device packaging operations and related value-added services of SteriPack Group, a global manufacturer of sterile packaging solutions for medical device and pharmaceutical applications. This acquisition includes a facility in Ireland as well as packaging production assets in Malaysia and the United States. 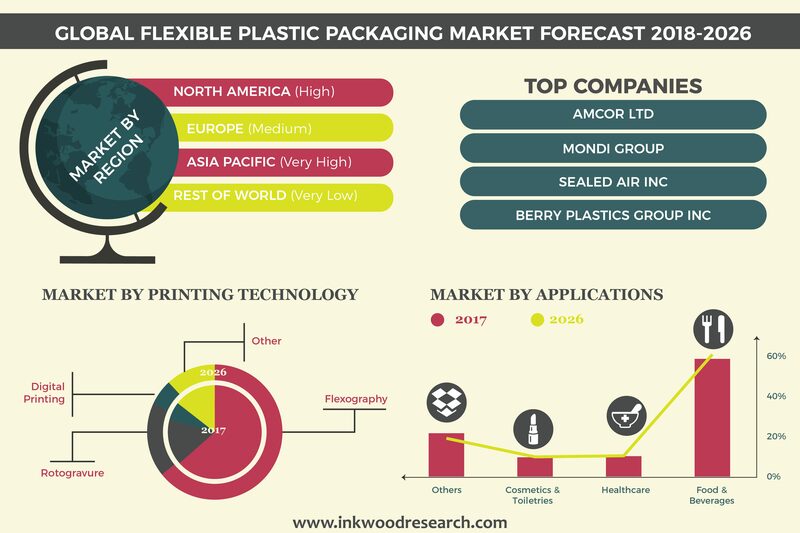 Key Findings of the Global Flexible Plastic Packaging Market. Cost-effectiveness & increased shelf-life of the product and downsizing of packaging is fueling growth in the global Flexible plastic packaging market. Asia Pacific is anticipated to account for the largest revenue share in 2017. Product launch is the key strategy adopted by various market players of the Global Flexible Plastic Packaging Market. Food & beverage segment is a major application segment.